Science fiction author Hal Clement (1922-2003) was known for creating aliens that are well-adapted to the often extreme physical conditions on their home planets. Clement is probably best known for his 1954 novel Mission of Gravity, which takes place on a planet with a surface gravity hundreds of times greater that of Earth. But that's not the only unique world he imagined. Clement's novel Cycle of Fire is set on the planet Abyormen, which orbits a dwarf star, which in turn circles a blue giant. The planet's usual orbit creates two sixty-five-year-long seasons; the "hot season" and the "cold season". Each season is dominated by a different intelligent species. Abyormen's life forms have evolved a unique form of reproduction to account for the widely varying in environmental conditions. All its creatures - including the intelligent ones - lay spores in their alternate season counterparts. Those spores lie dormant until the seasons begin to change. When the cold season on Abyormen draws to a close, the "cold" Abyormenites die and the "hot" Abyormenites emerge from the spores left in their bodies decades before. Those newly hatched "hot" Abyormenites carry spores for the next generation of "cold" Abyormenites, which in turn lie dormant until the next change of the seasons. Thus each sapient species on the planet absolutely depends on the life and ultimate death of the other for their own survival. Clement has said that Andre Lwoff's article entitled "The Life Cycle of a Virus," which appeared in the March 1954 Scientific American, gave him the idea for Cycle of Fire. Not only is the content of Lwoff's piece referred to in chapter fourteen of the novel but also the poetic tone of this scientific article underlies the novel. Lwoff describes the way certain viruses are capable of remaining dormant inside the totally alien life form of certain bacteria for several generations before they reappear as distinct virus life, and he emphasizes the cycles of life and death coupled here with reproduction and the protection of generation. 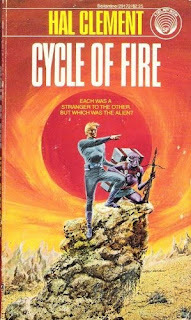 Although much of Clement's fiction avoids such sublime and poetic images, Cycle of Fire is meant to demonstrate, on this most elemental level of life and death (not microscopic in the novel, of course), the symbiotic inter-dependence of what seem to be very alien life forms. André Lwoff received the Nobel Prize in Physiology or Medicine in 1965 for his research on viruses - called "bacteriophages" - that infect bacteria. Bacteriophages have two different modes of reproduction. In some cases the bacterial cells are broken open ("lysed") after the viruses reproduce, in what is known as the lytic cycle. As far as we know, the bacteriophage itself controls its own regulation. The bacterium infected by a virulent bacteriophage has become a virus factory which cannot be stopped except by its own disintegration. A bacterium has no control over the development of a virulent bacteriophage. But this is an extreme case. The relations between virus and bacterium do not always have this dramatic character. As a matter of fact bacteriophages exist which do not kill all the bacteria which they infect. Some infected bacteria survive and perpetuate the ability to produce bacteriophages. These are lysogenic bacteria. Their investigation has profoundly modified our ideas on the relations between cell and virus. The DNA of the so-called "temperate" bacterophages that follow the lysogenic life cycle is integrated into the bacterial genome. The viruses remain dormant until the environment in the bacterial cell is favors lytic reproduction. It's easy to see how Clement drew on the life cycle of these microbes in imagining the life cycle of the Abyormenites. While this story might just be considered merely an interesting writing anecdote, I think it illustrates an important element of science fiction. Clement read an article about cutting edge science, but didn't just incorporate the scientific observations directly into his story. Instead he built on the science to create something very different from the original inspiration. I think that's one of the factors that distinguishes science fiction from fiction with science. And that's one of the reasons why I enjoy reading SF. The best kind of fantasy - when the characters live in a completely foreign world and you can still identify with them... or at least wish your life was that much of a soap opera. Wurts has a real gift for revealing what's going on inside a character's head, without resorting to first person. Great Post! Very informative dude. I saw this site while browsing and think it may be relevant Regulatory T Cells. Keep up the good work and thanks for sharing this view.